Continuing in my attempt to reduce the number of single-game discs in my collection, I hereby present RGCD Racers (Volume One). 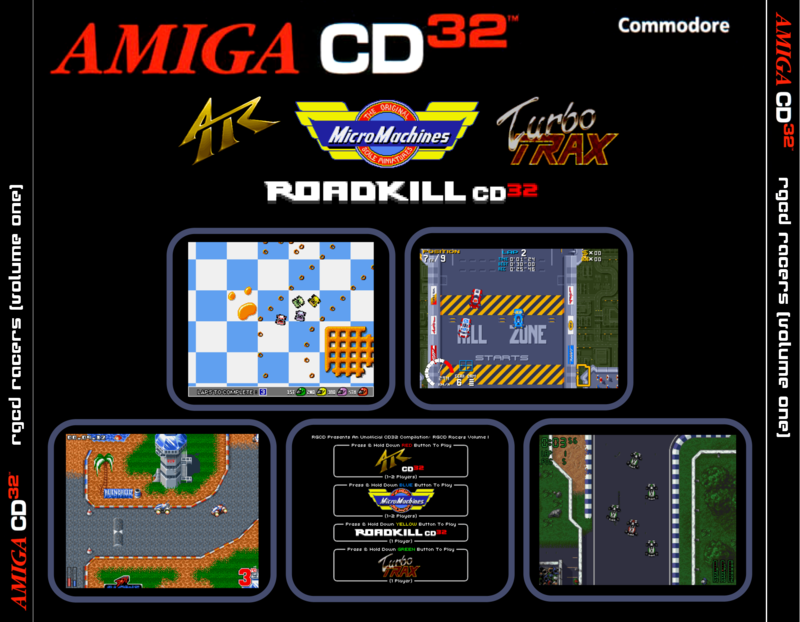 Included on the disc are All Terrain Racing (CD32 version of Jamie Woodhouse's much underrated and final Amiga game), Micro Machines (the all-time multiplayer classic from Codemasters), Roadkill (the best single-player racer available for the CD32) and Turbo Trax (a thoroughly tested and 100% working version of Arcane's 1995 hit). This compilation took me ages to complete, not because of the games featured, but rather due to those that didn't make the final cut due to incompatibilities with the CD32 console or read-only CD medium. 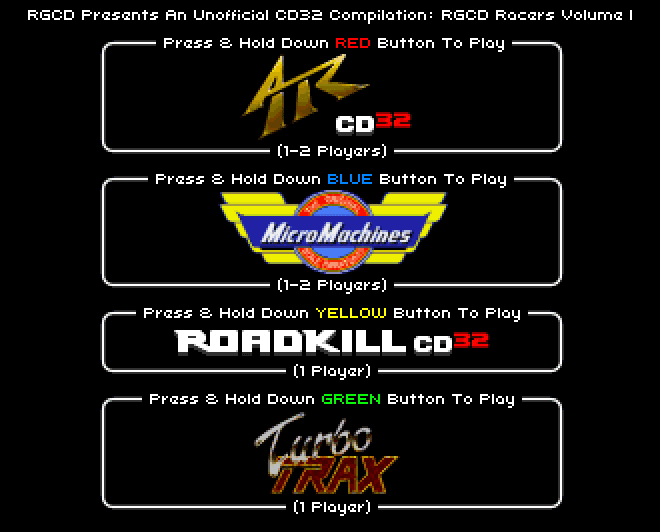 Instead of Jupiter's Masterdrive and a feature-complete Max Rally (originally planned) I decided to include CD32 versions of ATR and Roadkill - two personal favourites that have stood the test of time admirably. Another highlight of the compilation is Micro Machines (requested by EAB forum member 'Fingerlickin B') - it might not look much, but this 1993 gem is one of the most enjoyable two-player games available for the Amiga. Turbo Trax was included as my copy on the 'Megagames Volume 1' version occasionally crashed after the first race (which is unfortunate as it's one of the better unofficial compilation discs available for the CD32). I'm not sure if the other CD versions also feature this bug, but the copy here was created from an HD install via confirmed working disk images in WinUAE and has been tested thoroughly. 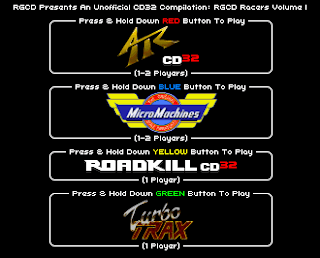 As a final note, the good news is that all of the games featured here work fine on a standard CD32 console - Micro Machines and Turbo Trax play fine without any additional keyboard commands.